Healthy intestinal flora are the key to good health, so mix a tablespoon of yeast with a tablespoon of brown sugar to feed it then resuscitate our sleeping workers with 2 ½ cups of water heated to 105-110F. Whisk it all together until the yeast cheerfully dissolves into its warm bath. Let it celebrate this new life for about 10 minutes. When the bowl looks like the aftermath of bubble bath poured into sludge, we’re ready for the next stage. Halfheartedly mix in the salt, red food coloring, and vanilla extract. The really interesting part comes from dumping in the entire box of cake mix and all of the flour. Keep stirring until the odd dank mess transforms into a dough, then attach the torturous looking dough hook to your stand mixer and let it rip and knead the red flesh for 6-8 minutes, until it becomes a smooth and glossy dough. If you prefer, you can always use your hands for 8-10 minutes. Form the dough into a ball and hide it from the world for an hour. When you return, it should have grown to twice its size. Take the wind out of it with a single punch. While it’s recovering, spread your largest clean counter with a bit of flour. You’re going to roll the entire wad of dough out until it’s about 18×24 inches. It seems to clean and dry. Mix your melted butter with brown sugar, white sugar, and cinnamon until it looks like dirty gravel. Smear the mix over your entire dough. You should end up with a pastry that looks like it has a bad case of road rash. Roll the entire thing along it’s long side so instead of a big rectangle of gravelly skin you now have a suspicious tube. Cut the entire tube into 2 inch wide slices. Lube up a 9×13 main pan and an extra 9” round (or 8×8 square) one, because this makes a lot of guts. 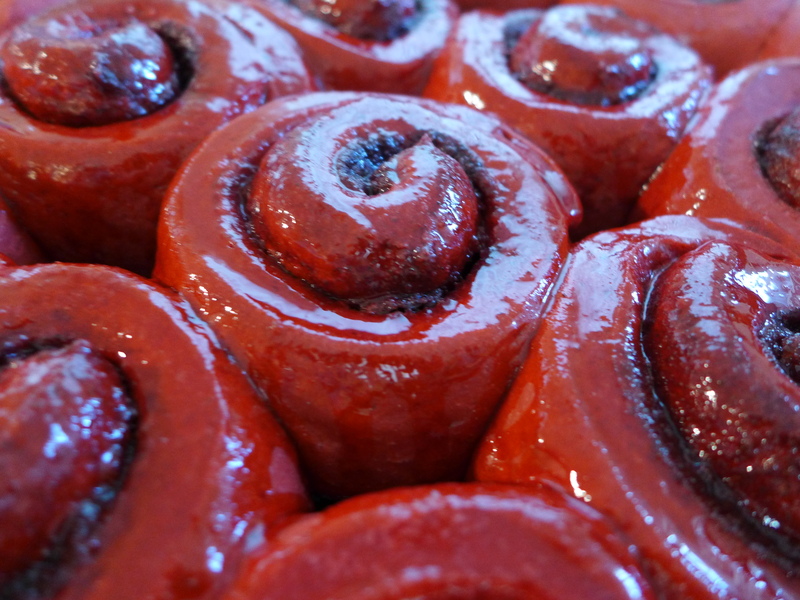 Or you can lose your guts at the last minute and bake them like normal cinnamon rolls. Now for the fun part. Gently unravel one of the rolls and loop it along the top of your large pan. You want to create the look of descending intestines with their natural whirls and dead ends and odd passages, so create little bunches of wavy lines in some places, an awkward circle in others, and lots of back and forth across the width of the pan. You don’t want to pack it in there too tightly. These still need to rise for another hour before they bake. It’s alright if you can see a few gaps down to the bottom of the pan. Just cover it up and wait for another hour. When you come back, the guts will be bursting out. Pop them into a 350F oven for 24-28 minutes. The flesh will darken and the highest edges will brown slightly, which only adds to the effect. While the guts bake, create your glaze by whisking together the melted butter, vanilla, salt, powdered sugar, and 2-3 tbsp of milk, depending on how thick you like it. The thicker the glaze, the more it obscures the beautiful red intestines you’ve just worked to create. You can always make extra as a dipping sauce if people prefer their guts extra gooey. Psst! 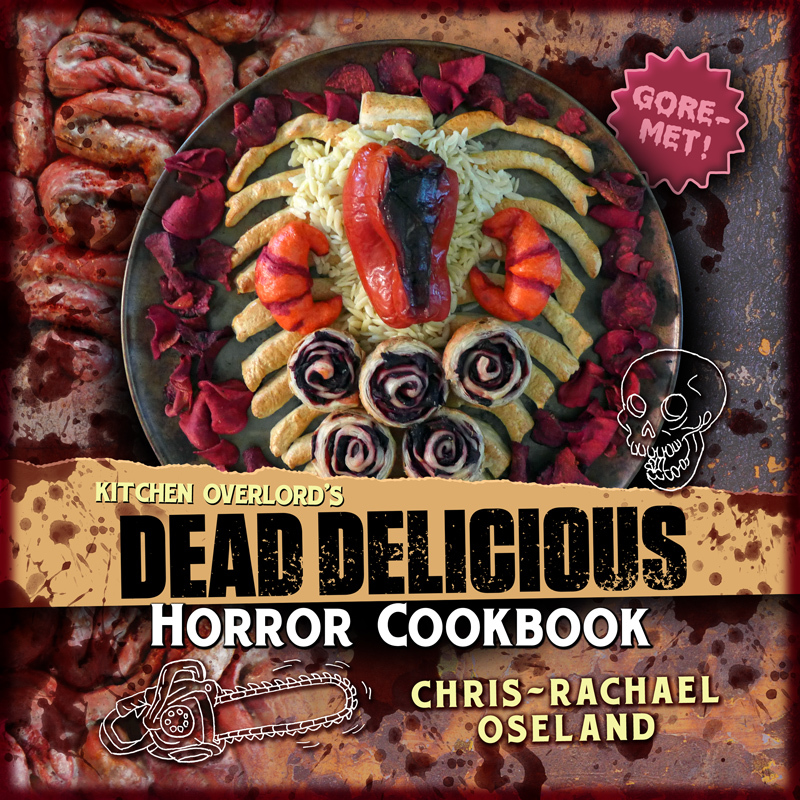 This year’s crop of Halloween recipes are ripped straight from the pages of Kitchen Overlord’s cookbook: Dead Delicious! 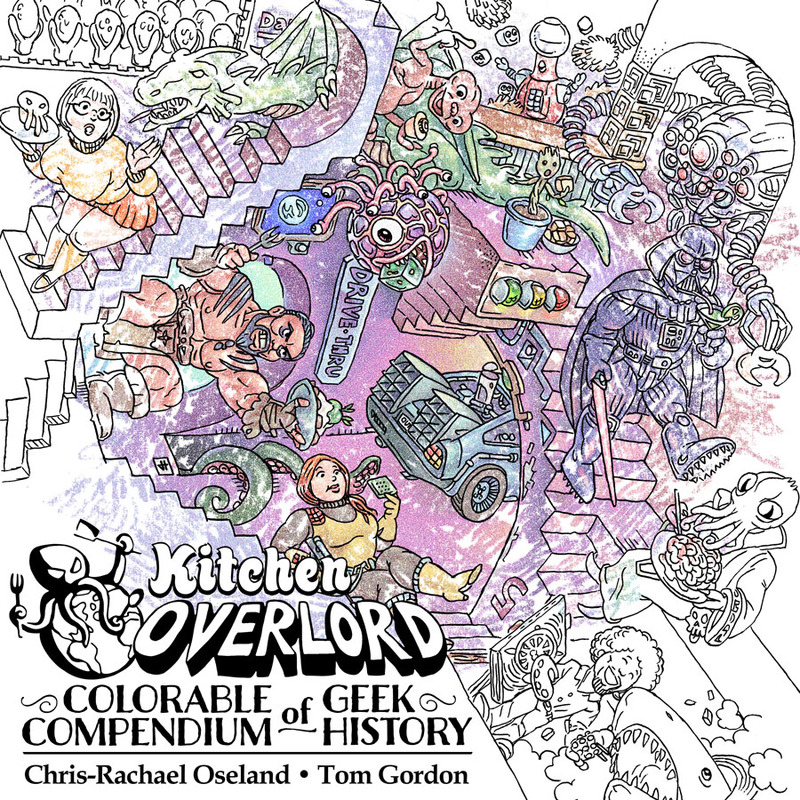 Whether your Halloween revolves around zombies, slashers, or body horror, you can cover your table with so many eyes, ears, guts, and brains your kitchen will look like the aftermath of a horror movie. Click here to get your copy now! It’s the perfect gift for your favorite Walking Dead fan! I used this today for a gross anatomy party. The kids loved it. Delicious. Also added food color to the glaze, a nice bloody touch. They’re on their second rise now. Woke up bright and early to make them so I can take them into work this morning. I didn’t quite place them perfectly, but that’s okay they’ll be funky and fun and gross! Thanks for the recipe! My husband saw this, and he asked me to make it for his work. Delicious! Tip for anyone making this. My husband spread the glaze in a hurry while rushing to work, but I would’ve done it differently. He covered everything with a heavy layer of glaze, and it turned white. I would’ve spread just enough glaze for a glossy shine, then put the remaining glaze in a bowl for people to drizzle after serving. You couldn’t really see how awesome my carefully-shaped guts looked after hubby drowned them in white glaze. Still impressed his coworkers though, and I’ve eaten way too much of it!!! So good! I know that pain! You’re spot on – a thin glaze lets the gore shine through. If you’re in a similar position (with this or a bundt cake or anything shaped and glazed) try grabbing some paper towels, hot water, and a pastry brush. Dip the pastry brush in the hot water and quickly paint it on the surface. Mop up the now slightly melted glaze with paper towels. Keep it up until you reach a glaze level you find acceptable then run the pastry brush over the surface a couple more times to smooth everything out. I want to make these for a dessert. Will they hold up at room temp for a few hours? Absolutely! They’re just as room temperature safe as every other cinnamon roll.